Over the years we have performed a number of punch force comparison studies to evaluate the sharpness of our FUE punches. As you can see from Figure 1, Cole punches are far sharper than any punch in the world. We performed a study where we evaluated the force required to break a piece of silicone rubber using a force meter. In this study we evaluated the 1 mm punch that is available from a variety of manufacturers. We placed each punch in a collet we designed to hold punches. We then applied a force to the punch. The force required to cut the silicone varied between punch manufacturers. In this study we evaluated several 1 mm diameter punches from a variety of vendors including Cole Instruments, Inc. Figure 1. Cole Instrument punches require the least amount of force to cut the same material. The force required to cut this material was significantly less for Cole Instrument punches than the nearest competitor. As you can see, the Cole punches cut the same silicone sheet with far less force than all of the competitors. 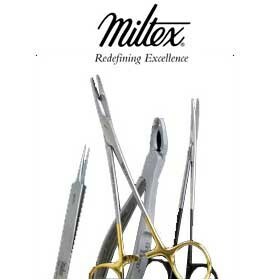 Please note that titanium nitride (TIN) coated cannula punches are offered by a number of punch manufacturers. In this study we used a commonly available 1 mm cannula punch from Ellis Instruments. All 1 mm TIN coated cannula punches have a similar duller cutting surface than the punches available from Cole Instruments. Removal of grafts in FUE requires two forces. One is the axial force, which is the force applied to the punch to insert the punch into the tissue. The other force is a tangential force, which is either an oscillating or rotating force around the axis of the hair follicle. 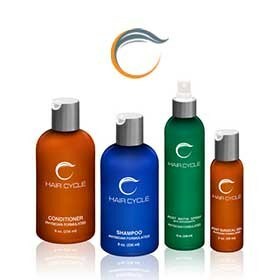 Follicles exit the scalp at an acute angle to the curvature of the skin. This means that the inferior edge of the punch will contact the skin first when the punch is applied down the direction of hair growth or the axis of the hair follicle (Figure 2). A greater axial force will result in follicle displacement in the direction inferior direction (Figure 3). If the follicle is displaced inferiorly, the follicle is at much greater risk of bisection. The surgeon must either instantaneously re-direct the punch in an inferior direction or bisection of the follicle occurs. Figure 2. The axial force on the inferior edge of the follicle should be minimized to reduce follicle displacement. Minimal axial force combined with tangential force help keep the follicle inside the punch and out of harms way. 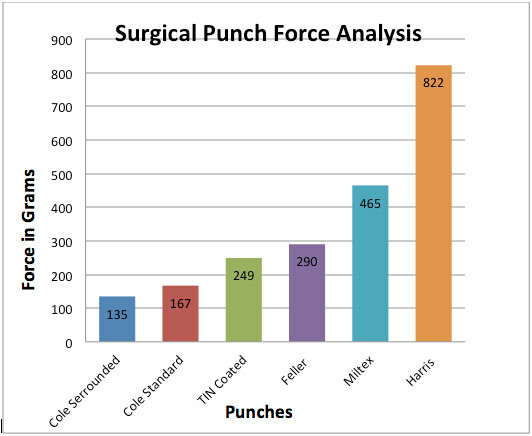 Cole Instrument punches are much sharper than competitor punches so the physician needs to apply minimal axial force. Figure 3. A large axial force will result in follicle displacement and the resulting follicle bisection or transection. 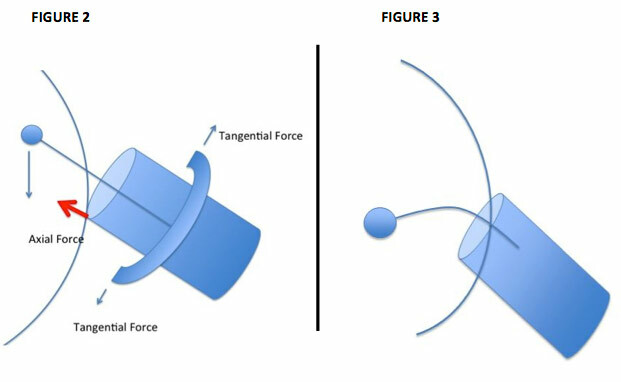 This figure also demonstrates how a duller competitor punch uses excessive axial force, causing the hair follicle to be displaced outside the axis of the penetrating punch. This displacement will result in follicle transection. The surgeon may minimize the risk of follicle bisection by using more tangential force or by minimizing the axial force through the use of a sharper punch. 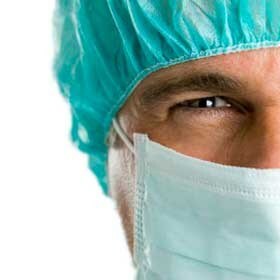 Both the required axial force and tangential force are reduced when the surgeon uses a much sharper punch. This is the rationale for using the sharpest punches available for FUE. 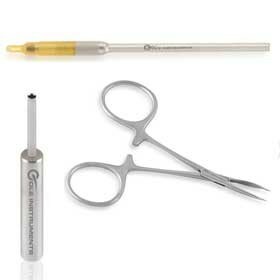 Sharper punches minimize axial forces and reduce the risk of follicle transection or bisection. Numerous studies have shown that Cole Instrument punches reduce the risk of follicle transection much better than all other punches on the market. 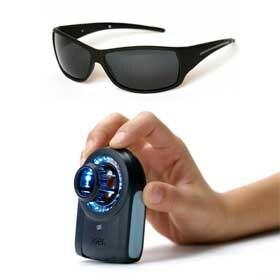 All surgeons and patients should insist on the most optimal equipment on the market for their hair restoration procedure. Combing these outstanding punches with our manual handle or our PCID produce the most optimal results possible for your patients. 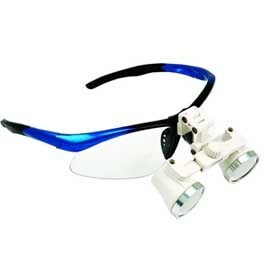 It is time for all physicians to step up to the best equipment on the market. Cole Instruments, where the punch does the work.